Girls, you can still ask your guy to Morton East’s February dance — but it’s not mandatory. That’s because Turnabout is no longer the theme; it’s now Winter Formal. Having school dances whether in junior high or high school have always been around. At Morton East every year we have a dance called Turnabout which happens a few months after homecoming and it’s more about having girls ask a guy to the dance rather than the traditional guy-asks-girl. In a random survey of 117 Morton East students, 19 reported that they’re going to attend the winter formal; 98 reported that they wouldn’t attend. “It’s the same dance just a name change, but it’ll be held in the field house and the main gym on February 1st,” Ms. Tracy Lloyd said. 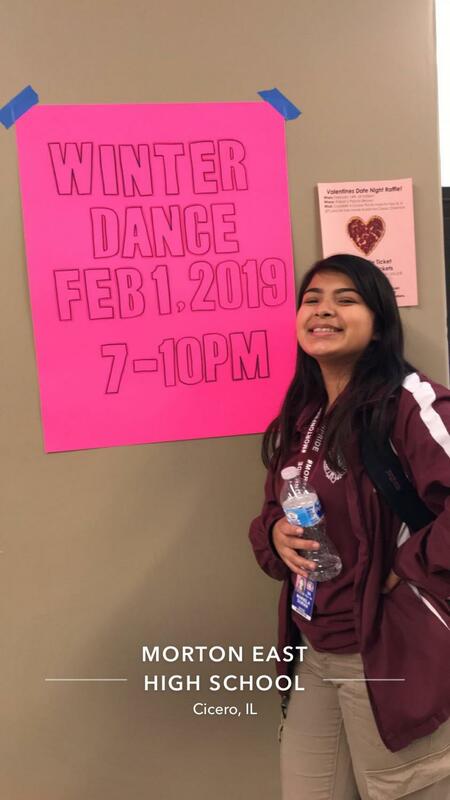 “The name change was a little confusing at first, but I actually like it because it makes it seem like those winter formals you see in the movies,” senior student Abigail Novoa said. As we always have a dance to celebrate Valentine’s day and winter, we know now that they change the name but it’s still the same thing. “As for every year, the dance will have a DJ in the field house and different bands performing in the main gym. There will also be 2 photo booths, one with a winter scene and the other with a valentine theme,” Ms. Lloyd said. There will be many activities for people to have fun at the dance. Many students enjoy the activities because they make it memorable. “I’ve gone to this dance twice and I actually enjoy it a little bit more than Homecoming. Not as many people go so no one is getting trampled on and the different bands that come in to perform are really good,” sophomore student Karla Garcia said. Having more students go to winter formal would actually make it better because that way they can actually experience how it feels in movies. “Everyone should go to this dance at least once or twice. It’s not necessarily just for couples; in my opinion, going with a group of friends is more fun. Overall, the dance is worth it,” junior Leslie Lopez said. I totally agree with the fact that girls shouldn’t feel that they have to be ask out to go to a dance. I also like the idea that they change the name of the dance because like that its more open to everyone. I have went to this dance twice and the music is alright. I also think people should go at least one time to just check it out.